Among California's African American, Native American, Latino and Hmong populations, a diagnosis of diabetes can have life threatening consequences. This multimedia program examines how three ethnic communities in California are dealing with diabetes and how culturally-based approaches to health care are lengthening and saving lives. For 61 year-old Carolyn Jackson, diabetes has been a journey. A doctor first told her she was "borderline" during a pregnancy. She started oral medication in the early 1990s, and it wasn't long before she was put on insulin. Then she left the workforce because she said monitoring her disease was too much to manage. Six years ago, her kidneys failed. She's been going to dialysis three times a week ever since. Jackson is one of millions of African Americans in the U.S. who have been diagnosed with diabetes. The black population has one of the highest rates of the disease - at more than 12% of the population. And they're twice as likely to suffer from complications, such as kidney failures and lower limb amputations. Carolyn says the high rates of diabetes in black communities are largely because of diet. But she says economic realities hinder people's ability to make healthy choices. Eddie Mendez is only 39 years-old, but has a lot of wisdom to share about diabetes. For twelve years, he chose to do all the things diabetics aren't "supposed to do." He ate poorly, drank alcohol, did drugs. He didn't take his medication. It took losing a limb and kidney failure before he changed his ways. "I've given up all those things that I loved so much. It's still in my environment... but I choose not to feed on that," says Mendez. "Your environment plays a very big role in your decisions, but it always comes down to you. What do you want? What can you do? What is your choice?" Mendez goes to a diabetes program at the Sacramento Native American Health Center (SNAHC). The talking circle strives to improve health outcomes that can prolong life. But behavior change is not so easy for everyone. Twenty-eight year old Fi Dan Lo is using his advanced degree in public health to bring awareness about diabetes in the Hmong community. His father's passion for teaching, and his health problems, inspired Fi Dan to excel in his own education. "I think me and my dad, we are a lot alike... . We like to teach, we like to encourage people," says Fi Dan. Fi Dan's father, Chia Chao Lo, was diagnosed with diabetes in 1985, about a decade after he emigrated from Laos. Mr. Lo says food, physical activity, health, everything is different here in the U.S.
"The reason why they're dying of diabetes is because when they came to the United States, they tried to eat and consume whatever they didn't have in Laos," says Fi Dan, interpreting for his father. Through the Hmong Women's Heritage Association, Fi Dan helped conduct research about the prevalence and understanding of diabetes in the Hmong community. He found that as many as 20% of those surveyed had diabetes. But he also found that they're hungry for education about the chronic disease. A familiar face to television news viewers across Northern California, Pamela Wu reported and anchored the news on KCRA-3 from 2001-2009. Currently, she serves as Director of Marketing and Communications at UC Davis School of Law. Dr. Rodney Hood practices internal medicine in San Diego, California. He is President of MultiCultural IPA, a local, independent physicians association whose membership includes 120 primary physicians and 200 specialists. Dr. Hood is past president of the National Medical Association, an organization of more than 30,000 African-American physicians. 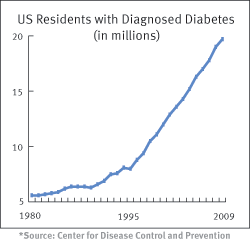 CapRadio News: Who is most at risk of developing diabetes? Dr. Hood: First of all, we've been seeing a worldwide epidemic in the incidence and prevalence of diabetes. 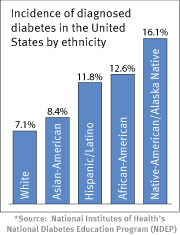 Worldwide, probably the highest increase in diabetes is in North America, especially in the minority populations and communities of color. There is underlying genetic predisposition no matter what your ethnicity, but environmental influences tend to exacerbate diabetes, so those who have poor food choices and become obese, those who have inability to detect diabetes early and do interventions that could prevent the further development of diabetes are the ones at risk. We tend to see that more in the African-American, Latino-Hispanic, and Asian communities.